Andrea's World Reviews: School Rules - 3D Light FX Review & Giveaway! Back to school means back to bedtimes. Over the summer(and weekends), my kids get to stay up pretty much as late as they want. My daughter is up until 11pm or midnight and my son stays up until I go to be, around 1-2 am. Obviously, going from that back to an 8pm bedtime can be quite the transition. I found it is easier to transition if there is something specific to get my kids excited for bed. We put out their clothes for the next day, which my son does not care about, but my daughter loves. She also loves her nightly bath, and things like a new blanket or pajamas and even new diapers or training pants(she only needs them at night) get her excited for bed. My son on the other hand does not care about any of those things, so getting him excited to unplug for the night and, instead of playing, do homework, get a bath, and go to bed is a much bigger challenge. Resourceful as I am, though, I found the perfect thing to get him excited for bed. 3D Deco Lights from 3D Light FX are so awesome. 3D Light FX has so many fun and exciting designs for boys and girls of all ages. Marvel, Nick, Star Wars, Disney, Univeral and much more, 3D Light FX has it all. My son is a huge super hero fan as well as a Star Wars fan, so I knew that he would love the 3D Deco Lights I chose for him. 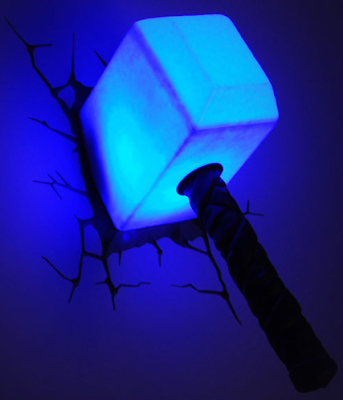 He loves The Avengers and his favorite it Thor, so naturally, Thor's Hammer is perfect for him. As a Marvel fan myself, I really love this one too. All of the 3D Deco Lights have stickers included that make them look like they are embedded into a cracked wall. 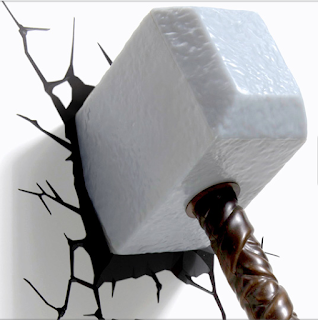 While they all look awesome that way, Thor's Hammer fits especially well for that as it really could have been slammed into the wall. No matter which Marvel hero has rescued your heart, 3D Light FX has you covered. From Captain America to Iron Man to Spider Man to The Hulk, you'll be in hero heaven. If you are not into Marvel(blasphemy!) you can get Batman instead. But if you are truly cool, you will want them all. Of course in order to believe in heroes, one also must believe in villains. Sometimes one must even embrace the villainous-ness of if all. In other words, you must come to the dark side. 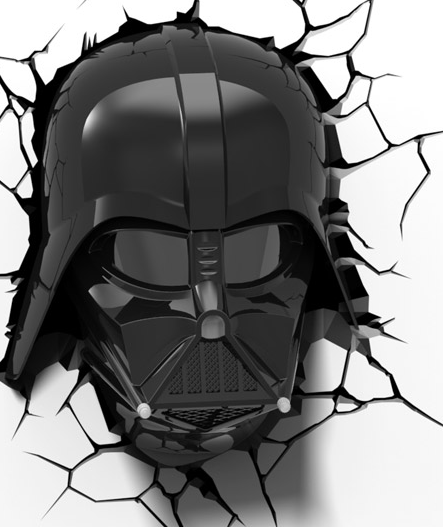 The best way to do that is with a Darth Vader Helmet 3D Deco Light. Does it get any more awesome than that? If you are not ready to come to the dark side, 3D Light FX has a huge selection of Star Wars Deco Lights, including Yoda, C-3PO, R2-D2, and the Millennium Falcon. Of course, the dark side has its partners as well, like the Death Star and Boba Fett. There is even a Darth Vader hand with Light Saber. That one I must own to accompany this one. Er, I mean my son must own it. Okay, I love these as much as he does! Whether on or off, these 3D Deco Lights look fantastic. They are a very unique room accent and are sure to garner many compliments when people visit your home. They are safe, cordless and battery operated.They use LED bulbs(that will last basically forever), they are cool to the touch, which is essential around children. My son loves these lights so much. No when I tell him it is bed time, he will hurry to get to his room so he can turn on these awesome lights. Now I just need to expand his collection and begin one for my daughter. With characters like Dora, Frozen, Minions, My Little Pony(last two coming soon), there are tons of designs that everyone will love. 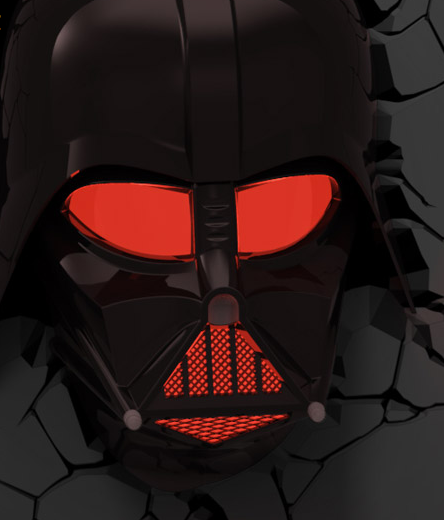 If you are ready to come to the dark side(AKA the side of 3D Light FX) you are in luck. 3D Light FX has been kind enough to offer one Thor and one Darth Vader Helmet Deco Light both to one very luck entrant. Enter via the Rafflecopter below. Good luck. My favorite light is Yoda!! He is so cute!! The Captain America Shield or the Millemium Falcon were pretty awesome, but my daughter would probably love the soccer ball too! I like the Spider-Man mask and hand. Our son would love all of these! I like the Teenage Mutant Turtles ones! I like the Hulk fist the best! I like the star wars light. My grandson loves star wars. My favorite is the baseballs. The 3D night light Spiderman mask would be the favorite here. I love the Boba Fett one! I think my son would really like the hockey puck light, I love that it looks like it is embedded in the wall. Love the ninja turtles one! My favorite is the pink butterfly light, my daughter would love it! I liked the hulk fist. I like the Olaf one. I like the darth vader! I love the Star Wars Millennium Falcon! I love the pink butterfly. I like the Hulk Fist 3d light we love all the marvel characters . I think my daughter would love the pink or yellow butterfly lights under their Nature section. Meanwhile, my grandsons would love the ones pictured above! I love the HUlk Hand!! These are so cool, my sons would love any of them ! my favorite is the ninja turtle one. My favorite is the Olaf one. My favorite is the Olaf light. We would love to have Olaf from Frozen. My granddaughter loves it. my favorite would be the My little pony that is coming soon. My daughter would love any of them. My favorite is the soccer ball. My nephew would love it.